Fishin' Buddies. 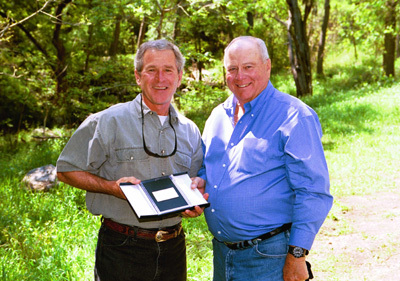 President George W. Bush and Walter Fondren, Chairman of the Coastal Conservation Assocation. Q: How high should the bar be set? A: This is the central divide in the debate over MPAs. Many pro-fishing groups support the idea of MPAs, but they often ask for scientific precision that is simply not possible in such a constantly variable habitat as the ocean. Here are some websites that present their case. yet equally effective options are available." The Freedom to Fish Act: " We must rally against this dangerous movement now underway to blanket our oceans with marine reserves or America 's 12 million saltwater anglers may lose their opportunity to go fishing. It will not stop with our coasts. If these efforts succeed, it could set a dangerous precedent that could ultimately affect all anglers. National Coalition for Marine Conservation: "First, a cautionary note. Proponents of MPAs like to point to our country's National Parks and Wilderness Areas and argue that similar kinds of "preserves" are needed in the ocean." National Fisheries Institute: " The National Fisheries Institute supports the use of MPAs as one among many fishery conservation and management tools. However, government agencies must ensure that ." Coastal Conservation Association: "CCA does not oppose MPAs, but ."